The 804 is the latest in the Node lineup from Fractal Design. The Node 804 has a dual chamber layout, with the motherboard on one side and with the PSU and hard drives on the other. There is ample space for installing fans, and several options for mounting radiators as well. It’s no wonder why Fractal Design claims that this Micro-ATX chassis focuses on cooling, whether your chosen medium is air or water. 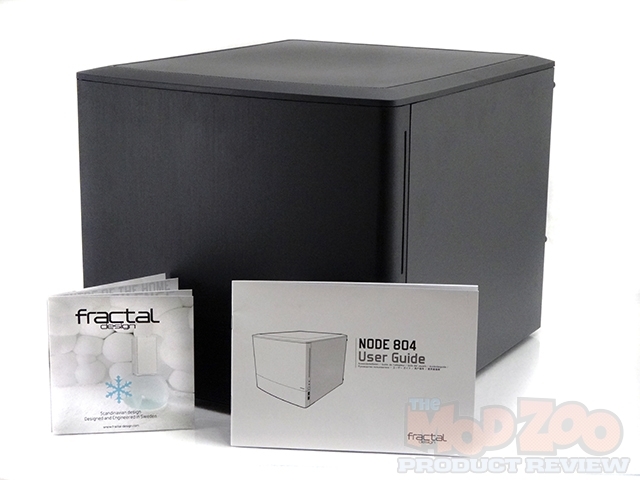 If storage is your main concern, well, Fractal Design has you covered there as well. Very nice review Mos. And another cool case from Fractal. Not sure that I like the mesh on the front panel, but I can see a lot of neat builds being done in it. I loved the results of this build by Mos. The Fractal-design Node 804 is very stylish and well made. If anyone hasn’t seen Chris’s build with hard line tubing, its pretty slick and the whole job looks fantastic! Excellent review Mosquito and most definitely a great build! This is without a doubt the most detailed and informative review of this case especially with your custom hard line loop which is just awesome! Another great case by Fractal Design. I totally agree for a version 2, since like you said, they love customer feedback! Peace!!! Thanks Demond. Even with the issues I ran into, this was still a fun case to do a build in, once I had it done. It was frustrating working under the gun for time and it taking an evening to do the hardlines, but definitely worth it. Jack Brownhill Got to be said, the Mod zoo written reviews are the best bar none, and no i will not climb out of bills arse! Im only messing, i really do love them, they give a builders perspective on the case, not only just a basic here is the case, they go into details and openly talk about flaws/improvements, brilliant. Nice review Mos. I do really like the dual compartment case design and I’m glad Fractal brought the design to the mATX form factor. It’s frustrating doing these reviews with watercooling and seeing how much of an impact as little as half an inch can make. It’d be nice to see manufacturers take these things into account. I loved the results of this build – could you please post a list of the components, especially the radiators, pump and reservoir. Maybe you still have more detailed pictures from the right side of your build?